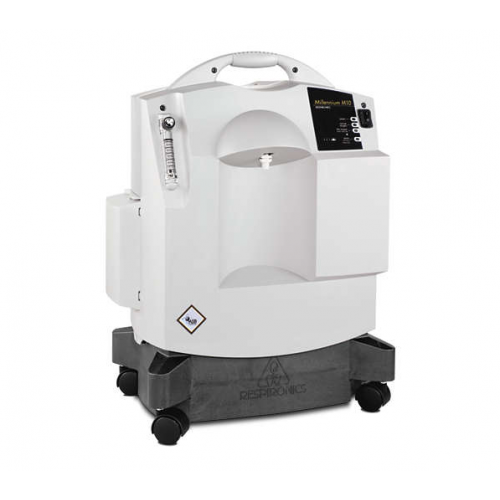 Respironics' Millennium M10 Oxygen Concentrator delivers up to 10 liters per minute (LPM) of oxygen; this concentration is the highest available at a medical-grade oxygen concentration. 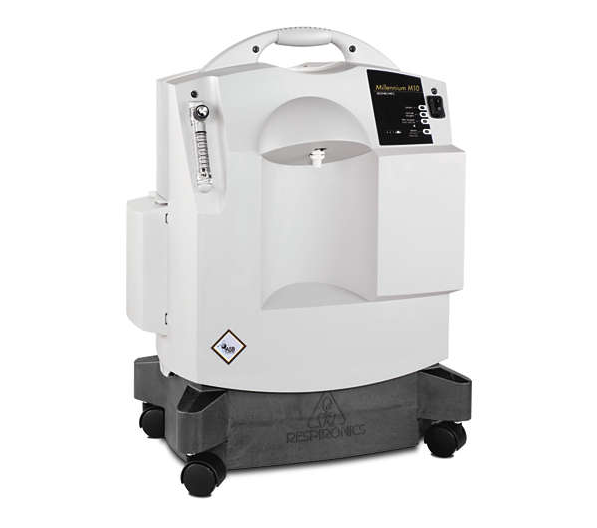 The Respironics Millennium M10 Oxygen Concentrator is the most cost-effective concentrator for high oxygen flow patients. In addition to the standard model (#M10600), a unit is available with an Oxygen Percentage Indicator (#M10605) that ultrasonically measures oxygen output as a purity indication. 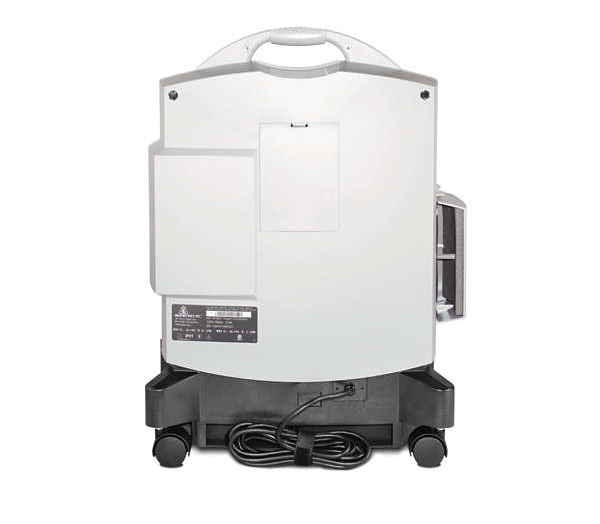 This Respironics Concentrator is engineered to reduce the cost of providing oxygen at higher rates and has fewer parts than any other concentrator sold today. Fewer parts and durable casters, as well as protected tubing and electric wires contribute to greater reliability. This dependability also makes the Millennium M10 Oxygen Concentrator one of the most affordable to own. To view a comparison of the top 10 Liter Oxygen Concentrators click on the following link: Review High Flow Oxygen Concentrators with Comparison Charts. Rental Program -- Not sure which model to choose? Try then buy. Hitting the road? Rent one to take with you. Generous Buy Back program -- Your satisfaction is important. If you are not 100% satisfied, we'll buy it back and help you select the right one. Loaner Program -- You will be issued a loaner machine should anything happen to the concentrator you purchased from us. Certified Oxygen Concentrator Specialists -- Trained staff will answer your oxygen questions. Vitality Medical's founder, a Registered Nurse, knows that Oxygen Therapy Devices are life-essential. We have a cross-company Oxygen Concentrator committee that has developed and administers an Oxygen Concentrator Specialist Certification process. Specialists have 35 minutes to pass a rigorous 50-question with a score of 94% or better. This testing ensures they can address your oxygen therapy needs. Our specialists recertify every six months to keep up with our growing Oxygen Concentrator product line. The M10 Oxygen Concentrator is engineered to be the highest-performing and most reliable Respironics Oxygen Concentrator available. Each M10 concentrator is individually tested in accordance with Respironics quality guidelines and comes with a written certificate of conformance and a one year standard warranty. The optional Oxygen Percentage Indicator (OPI) for the Millennium M10 is an audible alarm that sounds when oxygen levels fall below 70%. Maintenance-free SMC "sure cycle" valve that's designed specifically for the Millennium M10. Protective tubing neatly guards the electrical wires and tubing - helps eliminate risk of electric shock and increases reliability. Integrated sieve canister reduces tubing connections to enhance bed life. Twin head compressor: (higher stroke for more airflow through sieve beds). Smooth bottom makes cleaning cabinet easier. Highly durable casters designed to withstand rigorous usage. Storage/transport temperature: -30 to 160 degrees F.
Operating temperature: 55 to 90 degrees F.
Alarm indicators: High system pressure, Low system pressure, Power failure, Low oxygen level (OPI model available on the M10605 model only), No oxygen flow. 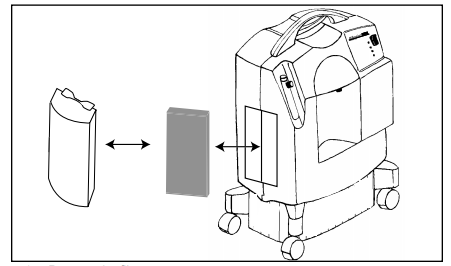 Respironics Millennium M10 Oxygen Concentrator Warranty: One Year Standard. Note: warranty voided if used for alternative purposes, including hyperbaric chambers. Optional extended warranty: Adds 2 Years to standard warranty. The extended warranty must be added at time of purchase. Call 800-397-5899 for details. 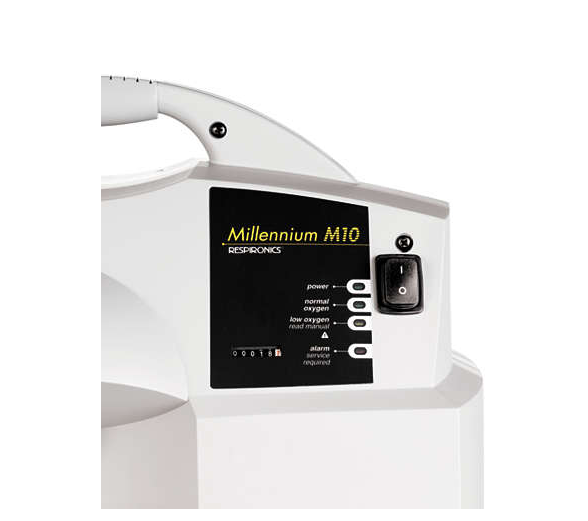 Millennium M10 User Manual offers instructions for patients to operate their M10 Concentrator. 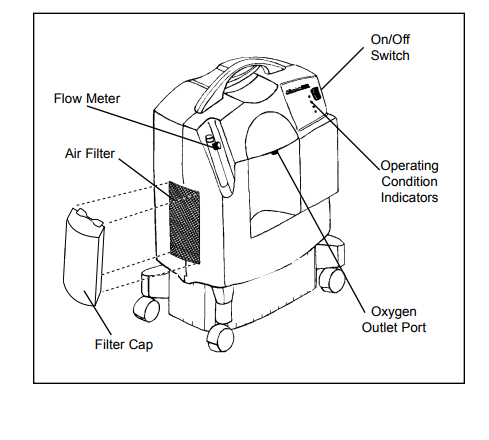 Millennium M10 Concentrator Maintenance Guide discusses cleaning and changing the air inlet filter and cleaning the exterior of the oxygen concentrator. Instructions to Replace Sieve Canister discusses changing the sieve canister assembly within the cabinet. Millennium M10 Troubleshooting Guide charts possible problems, cause and solutions. Vitality Medical also carries Portable Oxygen Concentrators for oxygen therapy patients who wish to live a more active lifestyle. Many oxygen patients, using portable oxygen machines also use their portable oxygen as their home oxygen system. When these oxygen patients travel, they bring their portable oxygen supply along with them. We also sell oxygen supplies, including oxygen cylinders, oxygen regulators, oxygen tubing, oxygen masks, oxygen cannulas, oxygen concentrator filters, and finger pulse oximeters you can purchase online for home or office delivery. Please allow an additional 2-3 days for shipping on all Respironics products. How good is this with LINCAR.